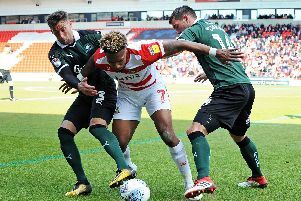 Darren Ferguson hopes to soon meet with Conor Grant’s agent to discuss personal terms over a permanent move to Doncaster Rovers in the summer. As reported in The Star in February, Rovers have a deal in place to sign the midfielder from his parent club Everton, dating back to before he joined on loan in January. Grant rejected the idea of a permanent move then due to reservations about dropping into League Two. But Ferguson is confident promotion to League One will sway the 21-year-old to committing his long term future to Rovers. And the Rovers boss revealed he expects Niall Mason to also join on a permanent deal at the end of the season. “The club have already agreed a deal with Everton for Conor Grant,” Ferguson said. “The boy wouldn’t commit to us at the time which I understand because he wasn’t sure whether we’d go up or not. “Now we’ve gone up, I think that’ll be a conversation with me, Gavin Baldwin and his agent to discuss the personal stuff. “With Niall Mason, I think we’re very, very close to doing something. “I think that will be done. Mason is out of contract with parent club Aston Villa in the summer and is not expected to be offered fresh terms with Steve Bruce’s side. Ferguson also revealed he will keep tabs on midfielder Jordan Houghton who is recovering after suffering knee ligament damage while on loan with Rovers. He said: “With Jordan we’ll have to see about the injury. “We’ll see him Friday because he’s coming to the game so we’ll see how he’s getting on. Contractual matters at the club will go on the backburner for now according to Ferguson with Rovers looking to secure the League One title. He said: “There won’t be anything further on contracts until the end of the month. “There will be a board meeting at the end of the month and all that will be discussed. “But that is all in hand.